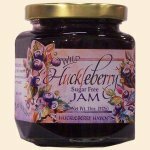 Made exactly like our regular Wild Huckleberry Jam bursting with Wild Huckleberries, but with no sugar added. Sweetened with sucralose & fruit juice. Be sure to try our Sugar Free Syrup too. Ingredients: Wild Huckleberries, Grape Juice, Sugar Free Pectin, Sucralose.